Tim's appear to have gone for the 'all things for everyone' approach to packaging design. They have maintained their traditional red and white stripes, they also have their similarly traditional mountain graphic, and even a modern image showing a pot of sour cream and a few chives that look a bit more like scallions. Overall, the effect seems to mix modern with classic along with mundane fonts not very well. As thick as regular, non Kettle Cooked Chips come, which allows for excellent crunchiness. The lack of broken chips in the packet was also encouraging. Thick cut, like Kettle Cooked Chips, but without the additional grease of that cooking method and with suitable amounts of seasoning powder. 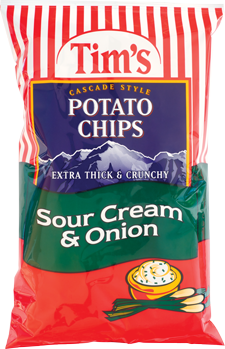 Sour cream is a bit of an odd one in the wonderful world of potato chips. It's not exactly a zinging flavor, so it seems like it might almost be a get out clause for the pairing flavor. However, that said, the onion flavor, although obviously dominant, was subtle and not in the slightest bit harsh.